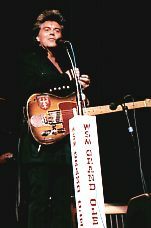 Marty and the Rock & Roll Cowboys performed on the Grand Ole Opry on Friday, June 5 and Saturday, June 6. Marty hosted half-hour segments on each show. Friday night, Marty played host to Opry regulars Jeannie Seely, the Osborne Brothers and Del Reeves. 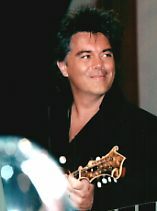 Marty and the band got to perform four songs--a new one called "That'll Be All Right With Me," "Last Date," "Hey Baby" and "Hillbilly Rock." 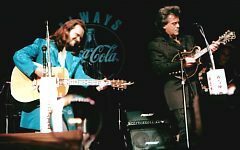 Marty mentioned he had performed "Is This My Destiny" at the funeral of Helen Carter (of the Carter Sisters) who had passed away earlier in the week. 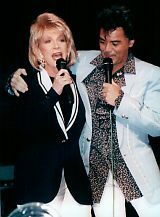 Marty begged Jeannie Seely to sing her big hit "Don't Touch Me." Jeannie's Girl Scouts were right down front to watch their favorite performer. Marty wanted Del Reeves to do his Roy Acuff imitation. Marty is, without a doubt, the biggest fan the Opry has. Being a Friday night, there weren't a lot of people backstage. Marty usually makes himself accessible to those fans wanting an autograph or picture. It was nice seeing him in something other than all black--it sure makes the pictures look better. Here are a couple other pictures from Friday night's show. Continue scrolling down to read about the Saturday night shows. Saturday night found the backstage area packed with folks. We arrived early and plopped down on chairs on the Green Room. Saw Mike Copelin first--wearing a jacket and tie! This formal wear suits him. The occasion? "We're hosting tonight." Also had a chance to sit and chat with Gary for a few minutes. I asked Brad how the repairs to his house are coming along. He said they are getting a brand new house, essentially. Brad said his wife and children were IN the house with tornado hit. Luckily, their house had a basement which kept them safe from harms way. We watched Opry Backstage on the TV in the Green Room (difficult to hear even with the sound up with all the people talking and the Opry actually going on during that time). We went out into the theatre and sat on the floor in front of the stage to watch Marty host. We were in for a real treat of a show. Leave it up to Marty to have a few surprises up his sleeve. Marty opened the show with "Little Things." The band Ricochet performed next. They had Dressing Room #1 (Mr. Acuff's dressing room) and the door was left open the entire night and band members were very accessible, even walking around backstage. 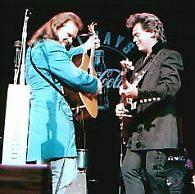 Marty then presented his surprise guest of the evening--the Georgia Flash himself--TRAVIS TRITT! They performed "The Whiskey Ain't Workin'." Of course, the highlight of the show was getting to see and hear the legendary Earl Scruggs. 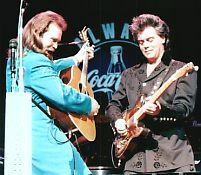 Earl's sons Randy and Gary along with Glen Duncan joined Marty and Travis on a few songs. 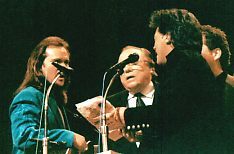 This was the Opry at its finest! The crowd thoroughly enjoyed these performers and it was apparent these guys were enjoying it themselves. When Travis, Earl, Glen and Marty performed an a cappella version of "Precious Memories," I don't think there was a dry eye in the house. You could have heard a pin drop! Going back to the side stage area, I practically ran into one Mr. Vince Gill. It takes a few seconds for your eyes to adjust for the very low light and had he not lifted up his guitar to let me through, I would have hit it head-on. Vince was also quite accessible and always had a crowd around him. Back in the Green Room we saw Marty's dad, John, and sister, Jennifer. Spent time talking with both of them. Jennifer closed her store on Music Valley Drive. I think with Opryland closing, it's had a devastating effect on tourism to Nashville in general and especially to the Opryland area of town. A lot of the retail areas in Nashville are disappearing. Most of the shops along Music Row are gone. Jen said she wasn't sure what she was going to do at this point. I asked Marty's dad where Hilda (Marty's mom) was and he said she was home dog sitting. Marty gave them a puppy last Christmas. He now weighs about 60 pounds and "has a mind of his own." It was sure nice seeing Marty's dad again. He said that now he's retired, he often goes out on the road with Marty. He is really proud of his two children! Travis Tritt happily signed autographs and posed for pictures with the fans. Security was right there to make sure things didn't get out of hand, but things were orderly and everyone was accommodated. For the second show, we again went out and sat on the floor in front of the stage. I only saw one Marty fan that I recognized. A lady at the Friday night show had come all the way from Nova Scotia to see Marty at the Opry. 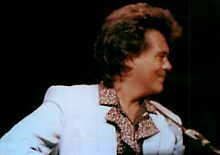 Marty opened the segment with a new song, "Red, Red Wine and Cheatin' Songs" which (as Margie Brodmerkle mentioned in one of her concert reviews) is a terrific song. He then brought Travis back out and they again sang "The Whiskey Ain't Workin'." The Scruggs family and Glen Duncan came out out a performed "Rollin' In My Sweet Baby's Arms," "Foggy Mountain Breakdown," Travis performed "Old Home Place," and they closed with "In The Pines." By the time we got back to the Green Room, the backstage area had pretty much thinned out. Marty and Travis emerged from the dressing room together. Marty walked over to us and said "hello" and asked Mario if he got some good shots (Mario took three rolls of film and only a portion of them are seen here). Marty is the ideal host. He stays on the stage and watches the other artists in his segment perform, he encourages the audience to applaud and sometimes will even dance. 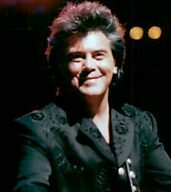 To have the opportunity to see Marty host 90 minutes of the Grand Ole Opry was really special.